Availability: The Current Military Supply Chain. 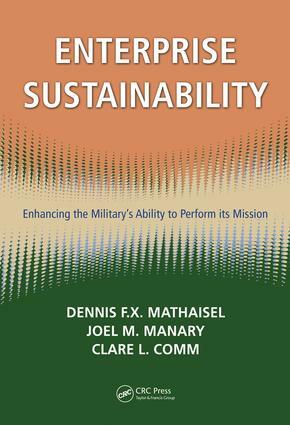 Availability: Enhancing the Military Supply Chain. Operational Availability. Reliability. Maintainability. Supportability. Capability: Performance-Based Logistics. Capability: Performance Measures. Affordability. Marketability. Dennis F. X. Mathaisel is professor of management science in the Department of Mathematics and Science at Babson College, and holds a doctor of philosophy degree from the Massachusetts Institute of Technology. Joel M. Manary is the lead systems engineering subject matter expert in the Systems Engineering Process Office (SEPO), a staff agency supporting SPAWAR Systems Center Pacific in San Diego. He holds a master?s of science degree in logistics and systems acquisition management at the Air Force Institute of Technology. Clare L. Comm is professor of marketing in the College of Management at the University of Massachusetts?Lowell, where she specializes in services marketing and buyer behavior. She received a PhD in marketing from the University of Cincinnati.